The Philippines is a great place to visit, because of the tropical climate it offers year round. With over 7000 islands, there’s so much to choose from. Surrounded by the waters of the Pacific Ocean and the China Sea it is the perfect destination for water activities. The mountains are rich with vegetation, rare birds and animals, exotic plants and rugged terrains. One of the places I love in the Philippines is Palawan. They call this island the “Last Frontier of the Philippines.” It is the only island in the Philippines rated as the best island destination in the East and Southeast Asia in 2007, by the National Geographic Traveler magazine. 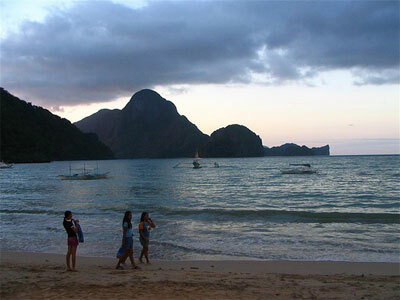 Palawan is also the cleanest city in the Philippines. The waters of Palawan are excellent for diving and fishing. The Busuanga Island, in Coron is the jump-off point for many dive operators. Under those pristine waters are 12 WWII Japanese shipwrecks sunken by the US Navy in 1944. It is about 131 ft. (40M) deep from the surface. It is a great exploration experience for shipwreck enthusiasts. This is one of the ten best scuba sites in the world according to Forbes Travelers Magazine. The Calauit Game Preserve and Wildlife Sanctuary is home to some of the exotic animals from Africa such as giraffes, zebras, elands, impala and waterbuck mixed with local animals such as the mouse deer, Palawan bearcat and peacock. This is like a mini-African safari where to these days the animals are free to roam around. This is a really great sight to see in Palawan. El Nido is the most beautiful place in Palawan with a mega-diverse ecosystem such as rainforests, white sand beaches, rich marine life, mangroves and their famous coral and limestone reefs. The “dugong” or sea cow, which is the rarest marine mammal in the world, is found in the waters of El Nido. This isolated island is separated from the main island by three bodies of water naming, the Luzon Sea, China Sea and Sulu Sea. The El Nido resorts at Lagen and Miniloc are a little more expensive, with cottages on stilts set above the crystal clear ocean waters. In Puerto Princesa—the province capital—is where you’ll see the Honda Bay. The bay consists of several islets with shallow reefs, beautiful beaches and resorts. The bay is a favorite destination for people who love swimming, snorkeling and diving. Locals and tourists alike love this place. For a small fee, you can go island hopping at the Honda Bay. You can also go underground at the St. Paul Subterranean National Park and explore the underground river with plenty of beautiful rock formations inside. The St.Paul National Park features limestone karst landscape. The distinguished feature of the river is that it flows directly to the sea. It also consists a full mountain-to-sea ecosystem and some of the most significant forests in Asia.